Melnor Aqua Sentry is an automatic rain delay device used in conjunction with Melnor's compatible AquaTimers. 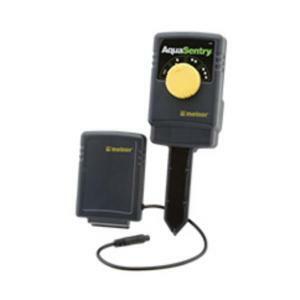 Aqua Sentry tests soil moisture content before each watering cycle to ensure the healthiest plants and lawns while conserving our water resources. Includes the sensor with soil probe and the receiver that mounts on the timer. Sensor must be place in line of sight to the receiver and no more than 200' away for best signal reception.